Last night at California’s Hollywood Forever Cemetery, Fox held a press evening including the stars of Sleepy Hollow, including multiple bodies sans heads. 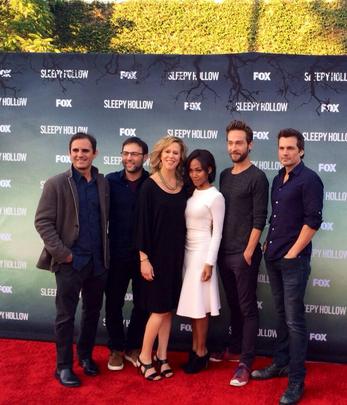 They held a screening at the mausoleum (I mean, where else would you screen Sleepy Hollow?) and of course a panel discussion in which Fox announced the premiered date for season two! FINALLY. It will be Monday, September 22nd at 9/8c. They are on their endless pursuit in which they are striving for an Emmy this season. During the press day yesterday, Fox sent their the headless horsemen to press outlets all around Los Angeles. Like everywhere! Oh and there were cookies, lots of cookies.